Vein diseases are more than just an aesthetic concern. If you suffer from varicose veins, it’s important to seek treatment because untreated varicose veins not only look unsightly but will often cause adverse health risks. Varicose veins are enlarged veins. Any vein may become varicose, but the veins most commonly affected are those in your legs and feet. That’s because standing and walking upright increases the pressure in the veins of your lower body. Although there is no definitive answer on what causes varicose veins, research suggests a lack of physical exercise and activity, physical trauma, pregnancy, obesity or simply genetics may increase the likelihood of varicose veins. In our legs, blood is collected in the superficial veins, just below the skin surface, and delivered to deeper veins which run within our calf muscles. The muscular action of our calves helps to pump the blood against the force of gravity towards the heart. One-way valves inside the veins prevent the blood from travelling backwards. In some people, these valves fail and blood starts to travel backwards down the leg and pools up inside the veins. These veins then experience higher pressure, and gradually become swollen, lumpy, twisted and darkish-blue in appearance. What to do for varicose veins? Avoid standing for extended periods of time, if you can. Lose weight or maintain a healthy weight/lifestyle. Whatever caused your varicose veins, there are solutions for you and your situation. 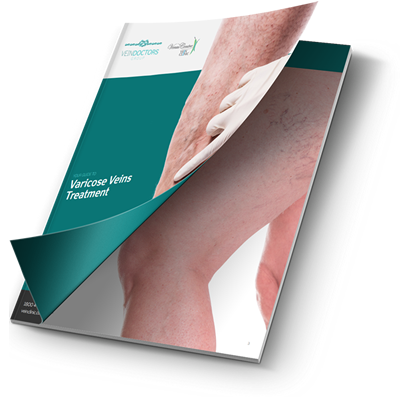 Inside our free guide, you’ll find information on the causes and symptoms of varicose veins. We also discuss the adverse health concerns if left untreated and revolutionary non-surgical treatments to treat vein diseases with little to no downtime or discomfort. Find out what to expect at your initial consultation, or contact our friendly team. Do you have painful veins which are throbbing, aching or itching? Are they swollen and raised above the surface of the skin? Do they appear twisted and bulging with a blue or purple colour? Left untreated, varicose veins can develop into a life-threatening condition called Deep Vein Thrombosis. Can varicose veins be dangerous? Varicose veins normally get worse over time. This is true even if you make the necessary lifestyle changes to control them and manage your pain. While they may be unsightly, they usually don’t cause any long-term medical problems. In some cases, varicose veins can lead to ulcers or sores on your legs, blood clots, or chronic inflammation. If you have a severe case, your veins could rupture. If you develop any of these symptoms you should visit us at Vein Doctors Group to be treated. Our doctors will first discuss your medical history with you and examine the areas of concern. Our team will then utilise state of the art ultrasound imaging equipment to examine your condition. This innovative technology provides the highest imaging resolution available to allow our medical professionals to examine both deep varicose and superficial veins with ease. Does exercise prevent varicose veins? The most beneficial exercise to prevent varicose veins is walking. Yoga is a good option as well. You can practice many poses that bring your feet higher than your heart. These are called inversions, and they include a headstand, shoulder stand, and legs-up-the-wall pose. Yoga can also help stretch and tone the deepest muscles in your calves and hamstrings. The deep muscles can, to a certain degree, help the vein valves work properly. Stretching and toning poses include downward-facing dog pose, most forward-bend poses, and sun salutations. Other types of beneficial exercise include cycling and swimming. How to treat varicose vein pain? Elevate your legs – For immediate relief from the pain and discomfort associated with varicose veins, elevate your legs above your heart. This will help make it easier for blood flow in your lower body to circulate toward the heart. Exercise and stretch your legs – Short exercise to stretch your calf muscles a few times a day could also be helpful. Flex your feet frequently, especially during long trips when your leg room is limited. If you have to sit or stand in your job, change position at least every 30 minutes and bend knees regularly. Use cold water – If your legs are in pain at the end of the day, shower them with cold water. Cool temperatures cause blood vessels to shrink. This should alleviate swelling and the associated feeling of heaviness, as well as overall discomfort and leg cramps. Avoid taking hot baths and spending time in hot tubs. Heat has a negative effect on your veins, and the throbbing pain can become even worse if you spend too much time in hot water.